Despite the fact that I'm not a big newspaper reader it's hard to escape some of the sensationalist headlines and stories that they print, no I'm not talking about celebrity gossip or Double Decker buses been found on the moon, I'm a Brit so of course I'm talking about the weather! Apparently blizzards and snow will be with us in the UK before October is out; Personally I'll believe it when I see it, but there is no doubt that the temperatures have plummeted a bit in the last week or so, but to be honest I think I am still in denial, yes pumpkins and witches hats are everywhere now and the Boots Christmas Gift Guide is out but I'm still clinging onto summer and carrying on with my 'summer' beauty routine. For once I'm not being lazy and keeping up a regular hair removal routine (more on that to come! 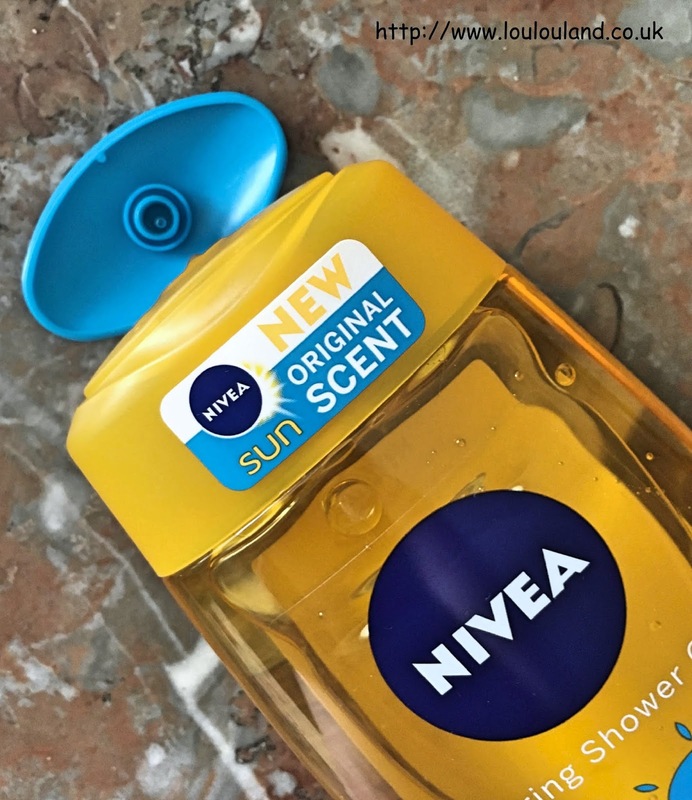 ), I'm still playing with fake tan (more on that to come as well) and I'm embracing a beauty product from heritage brand NIVEA, the scent of which takes me way back to warmer and sunnier times. For as long as I can remember my household has been a NIVEA house. From that familiar, retro blue and white tin, to the blue and yellow bottles of their suncream, it's a brand that's intrinsically linked to so many happy memories. In comparison to so many of my peers I was pretty old by the time I went on my first proper holiday abroad. With a giant of a dad that wasn't keen on flying, and money that could probably be spent better elsewhere my holidays as a child were UK based, I was happy and to be honest I didn't mind that much, I'd been abroad with the school and that was enough for a while. When I got into my late teens though the lure of a proper beach holiday was real, and when I was about 18 or 19 I went on a plane for the first time and I went to Spain. I still remember the excitement of packing my case with bikinis, shorts, flip flops, and of course a couple of bottles of NIVEA suncream. 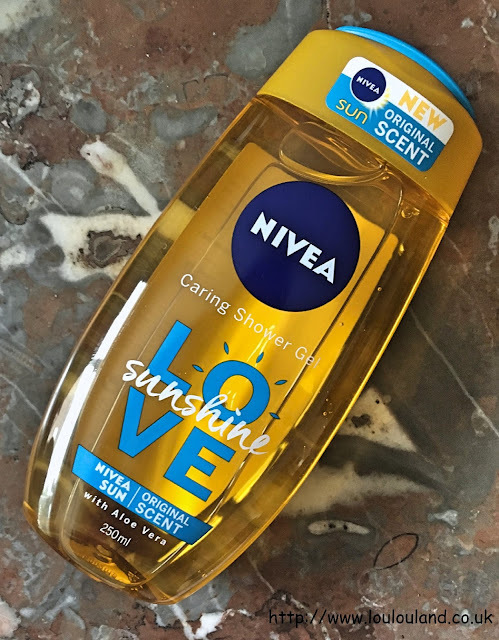 I'm not the biggest fan of coconut as a scent and that's probably why over the years I've always loved the scent of NIVEA's sun care range. As you've probably gathered from quite a few of my posts, I'm pretty useless at describing fragrances, but the official line from Claire Marlow Brand Manager at NIVEA, is that the traditional NIVEA sun scent contains fruity notes of Clementine and Pear Sorbet, floral notes of Osmanthus, Blue Freesia, and Magnolia, and warm notes of Amber and White Musk. 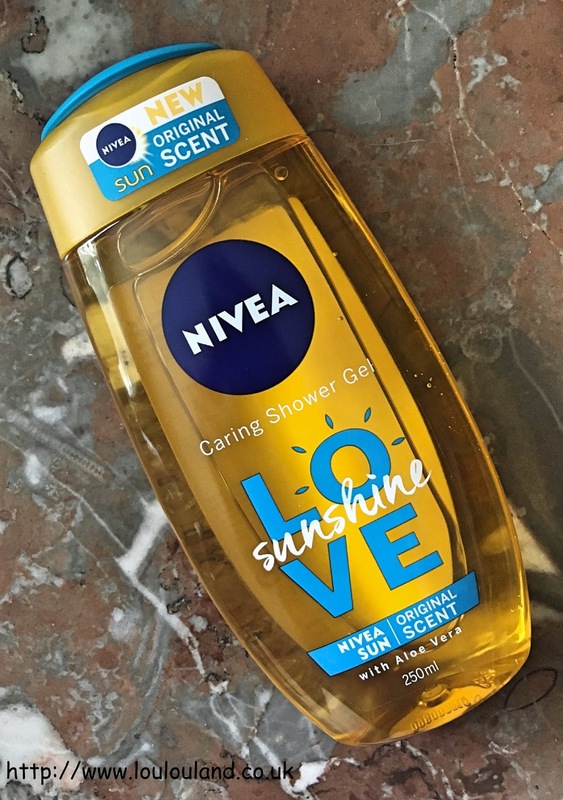 Whatever it contains though I just see it as a fresh and clean scent, it's not overpowering, it's just warm and comforting and for me and so many others it's a fragrance that just screams Summer. Conscious of the love that their customers feel for the traditional scent of NIVEA Sun, earlier this year NIVEA decided to introduce a product that would allow us to experience the scent of summer all year round, the NIVEA Sunshine Love Caring Shower Gel. Featured on This Morning, and named as one of renowned beauty editor Eve Cameron's best Spring beauty buys, this shower gel comes packaged in a chunky, easy to hold, flip top cap bottle. The packaging embraces the traditional NIVEA Sun colours of blue and yellow, but here the yellow dominates, with the bulk of the bottle being made from a clear sunshine yellow, amber plastic which mirrors the clear, pale amber liquid within. 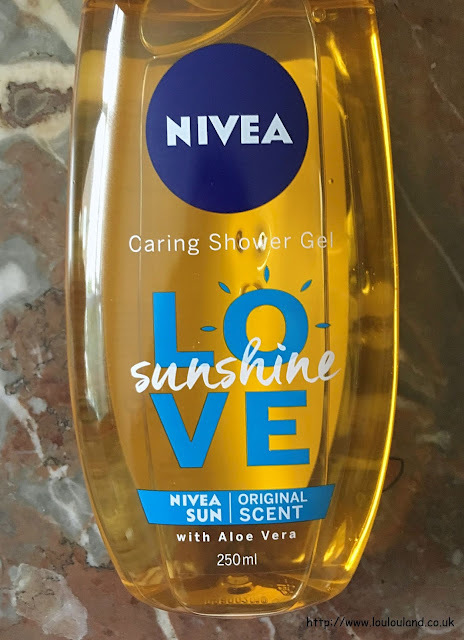 With the heady, yet subtle scent of NIVEA Sun, this shower gel obviously contains no SPF or UV protection but it is dermatologically tested, and it's crammed full of Aloe Vera to refresh, moisturise and soothe the skin. Only a tiny amount on a sponge or a shower scrunchie produces a rich creamy lather. It does contain SLS but in my experience I still found it very moisturising. 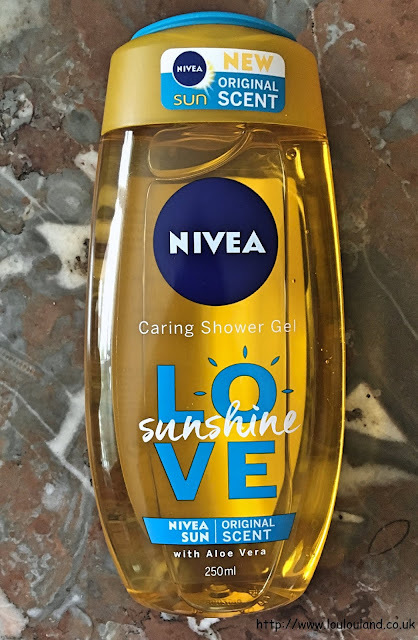 Having hit the big 4-0 earlier this my skin is definitely getting drier but this shower gel certainly didn't exacerbate that tightness and dryness, my skin just felt smooth and clean. 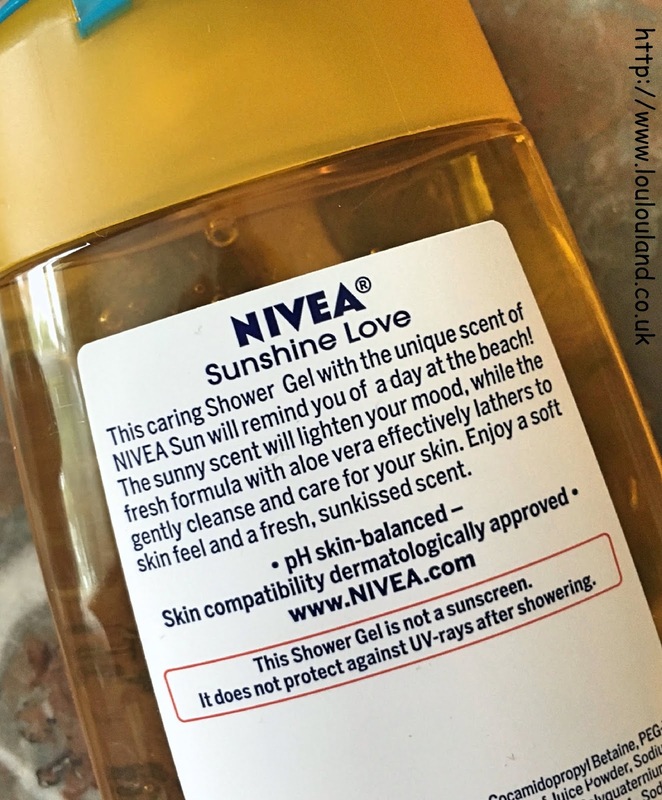 If you have a little bit of winter sun planned, this shower product is perfect for removing sun lotion, salt, chlorine and sand, and for reviving the skin after a day at the pool or the beach, but even if a beach holiday isn't on the horizon it's equally good for transporting you back to sunnier climes after a day out in the wind and rain.